The Fringe multiverse is back! I've been looking forward to this. However everthing has changed for the moment and nobody even remembers Peter anymore. So we've got an orange universe now rather than a blue or red one. Things are all a little bit different and it looks like it's going to be a while before anything is even close to back to normal. Knowing this show it may never even be completely the same. I'm still enjoyed it though (after one episode of season four). The lack of Peter is quite strange but it's good for now as it gives us more Seth Gabel as Lincoln Lee. I have had an on and off relationship with reading over the years. Unfortunately recently that has been trending towards off again. I've just not been finding the time to read. I've not stopped completely but the amount has decreased a lot. However I do now know enough to notice and realize that this is a bad thing. So time to do something about it. 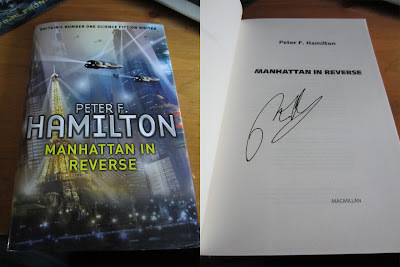 In almost perfect timing Peter F. Hamilton announced a new short story collection on his Facebook page. I'd not been aware this was coming so it was a nice surprise. If there is anyone who can pull me back in to the reading zone it will be Hamilton. Now of course normally I'm a big Kindle reader these days. However later that day there was another Facebook announcement, that there would be 500 signed copies available for pre-order at Play! As a big fan I decided I should be one of those 500. The book arrived this afternoon and I'm looking forward to reading it. Although for such a nice signed hardback I'm half tempted to buy the Kindle version as well for actual reading and to leave this nice. Yesterday I said I would talk about the new Opeth album today. However I've not actually listened to it yet, so that will have to wait, perhaps tomorrow. 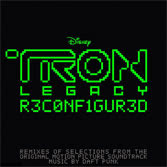 What I have been listening to is a remix album from various artists remixing Daft Punk's Tron Legacy soundtrack. It has been a while since I've fell in such instant love with an album. This is especially surprising for an album that's not even metal but still I keep listening to it. I had not previously heard of this band. Amazon recommended it to me because I'd previously bought the latest Within Temptation album. My new camera unexpectedly came with a £10 Amazon MP3 voucher. The descriptions and reviews of this album sounded good so I added it to my basket along with the new Opeth album. Opeth I'll talk about tomorrow, today we have Njord by Leaves' Eyes. It feels to me like in recent years female fronted symphonic metal has become much more popular. The first time I ever remember hearing it was with Nightwish. Did their success make the genre more well known? Or were they just my introduction to the genre? I don't know the answer to that. I do know that it's a style I enjoy. In addition to Nightwish and Within Temptation as already mentioned there are other examples such as Epica or Lacuna Coil. Leaves' Eyes are another good one to add to that list. As Amazon suggested they are very similar in style to Within Temptation and there are some very good track on the album. Yet as I write this, the day after listening to it, I don't actually remember any specific details. I'll have to listen again and get to know it, but no instant classics. 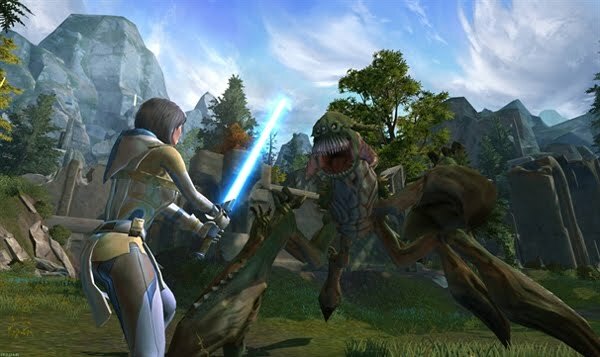 The Old Republic: Release Date! There was extremely important news this weekend. BioWare/EA finally announced the release date for Star Wars: The Old Republic. It will be available in the US on December 20th and in the EU it will be available on December 22nd. I'm glad we know what day to look forward to now, but that's awfully close to a weekend I usually spend away from home. Although the pre-order pack does promise early access, but I wonder how early that will be. At least that date means it will be a month and a half after The Elder Scrolls 5 and a couple of months before Mass Effect 3. So that's good, not that I expect I'll be through my back log anytime before then. I'll finally be allowed to talk about my testing experience but once the game is available that is not really relevant anymore. I'm definitely looking forward to it though. I'm really loving my new camera. I was lucky that the failure of my old camera coincided with a big business payment. My old Canon Ixus 80 was no more, but it was over three years old and had taken 1599 pictures. Part of me wishes there had been time for just one more but that's not really important. The Ixus 80 isn't in production anymore so I started looking at alternatives. The replacement model was the Ixus 110 which seemed nice but I decided to look for something with some more advanced features. After a brief look at other manufacturers I decided to stick with Canon as the previous one had done so well for me. The final choice became the Ixus 220HS in matte black. Also as a bonus they appear to use the same battery type, so now I have a spare. It switches on fast, has a large screen, takes 12MP photos and records 1080p video. There are many lens and filter options including tilt shift, fast captures and slow motion. I've been enjoying playing with it so far. I'm sure some things will loose their novelty but I've always been a fan of the tilt shift effect, which makes things look miniature. Generally it takes great photos with very little effort but gives you full control of a wide variety of options for those special times you need to do something different. The Lodger was an episode I enjoyed but I wasn't sure we really needed to see Craig again. Although I guess we're about to get a whole lot of crazy timey whimy emotional stuff next week so a bit of fun first is in order. 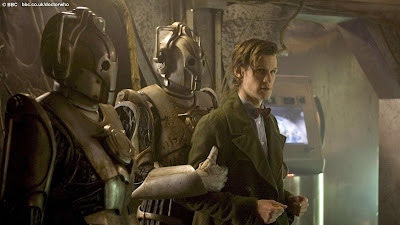 I've always been a fan of the Cybermen and Matt Smith hasn't really had a full story featuring them yet. I'm not sure this really counts either, they still didn't feature very much. It's still much more about the Doctor avoiding/accepting his death. I have an age related question. 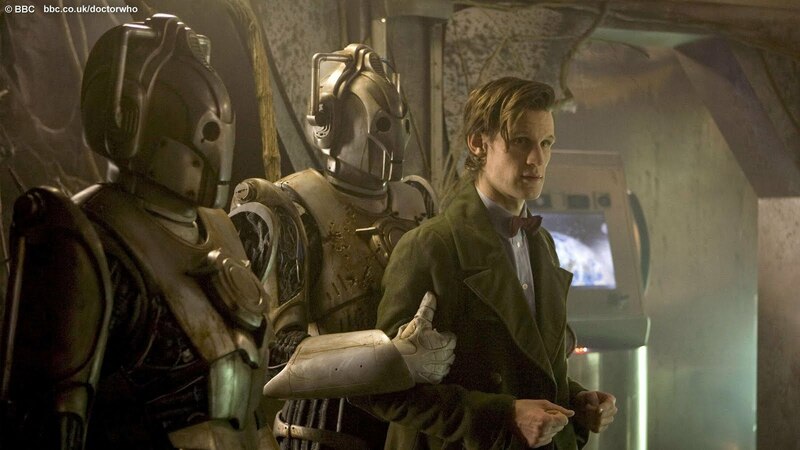 Back in the Impossible Astronaut the future Doctor who died was 1103 years old, nearly 200 years older than the current Doctor at the time. Has that time just happened since he left Amy and we've skipped 200 years of his life? Or is that about to happen? Obviously time is all relative, he says his death is tomorrow but not if he vwoorps off somewhere else first. However he did sound like he was resigned to the fact that he was going to go there next, plus he took the blue envelopes and hat. So what has/will he been up to on his farewell tour? Now we just have to wait one more week. There were lots of interesting looking things in the sneak peek, none of which made any sense. However you do need to make sure you have them correct in the first place. 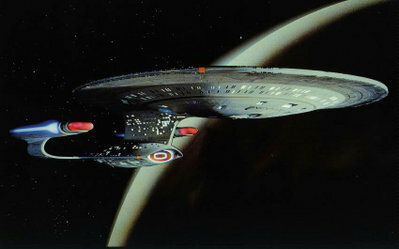 I'm liking the fact is may be possible to travel faster than the speed of light after all. The implications are huge if it turns out to be true. I've not read a lot of detail about what actually happened, just the general press versions. I'd like to find the time to read some more about it but time is a little precious at the moment. That just leaves me to fantasise about the future as faster than light travel for humans is the key to interstellar travel. That dream is a quite a way off but this could be the first tiny little step. I've been neglecting this blog a little recently. There have been lots of short posts and late posts. It needs a fresh start and a renewed effort. However unfortunately today is not the day for that. There is work which needs to be completed first. After a different start compared to usual I keep getting my days mixed up this week. It's Wednesday! That's just a reminder to me, you probably already know that. I shall try and get things back to normal tomorrow. It's been a busy couple of days. I've been out and about and not had a lot of time for the blog. That ended with me dropping my camera (while the lens was out) and breaking the gears or whatever opens it. So a new one of those will be needed. I did get plenty of photos before that though. Chronicles of Graham on Sunday. Live band tonight nothing else to post until after that, photos later on. I am currently not sure what I will be doing for the rest of the day. I know that am I going out this afternoon but those plans are vague and I realize I have no idea when I will next be at my computer. So in case I'm late back I'm doing this quick blog post now so that I don't have to worry about it. This was an interesting episode of Doctor Who. However I'm not sure it was anything new. 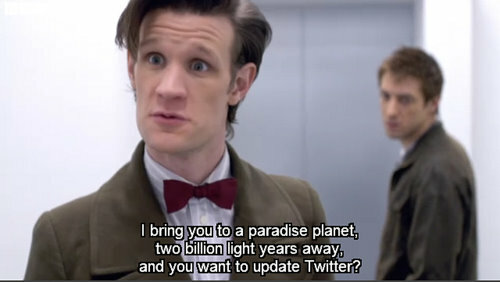 The idea of the Doctor having a God complex is not a new one and has been covered before, as recently as with Tennant. Still there were some fun moments and the Minotaur looked great for a BBC production. Also no more Pond's (for a week anyway) I wasn't expecting that. Although thinking about it I did know the next episode was coming. I guess I presumed it was one of those production saving ones which doesn't have much of the main cast. I'm not finding myself with a lot to say about Ringer. There's been quite a lot of Internet hype, at least in the places I frequent, but I think that's mostly due to Sarah Michelle Gellar. No disrespect to Gellar, she is a great actress after all but there was far more to the Buffy series than just her. Watching Ringer there were a couple of moments where certain phrases or infections sounded like Buffy but I guess that's actually the real Gellar coming through. It occurred to me the other than a couple films I'm not really seen her in anything else. The problem with this pilot is they are setting things up for an ongoing mystery which obviously isn't going to be sorted any time soon. For that reason it feels like not a lot really happens. We get a lot of new characters all with there own schemes and no-one is as they appear, but there has not been enough time to get to know them yet. So with introductions out of the way I wonder if episode two will be different. I'm not sure if I'm in this for the long haul yet. And so the Miracle is over and the latest series of Torchwood is at an end. Now that the series is finished I'm not really sure what to say about it. As it's been showing I've enjoyed each episode but now as a whole I'm less sure. It started of very slowly with some interesting questions about life and death. The world's response to that was bad so the Torchwood team needed to fix it. There was a lot of investigating but it took a long time to get anywhere. It was like a long discussion on the effects of immortality but without a solid conclusion. We get The Blessing as the MacGuffin cause but we never really get to know what it is, other than a hole in the ground. To me it didn't feel like an end to the same series, especially after they pulled the "three months later" trick two episodes before the end. There were moments that felt a little convenient for plot's sake. Still overall way above average. I did like how international they made it feel. For much of Torchwood before it only felt like Wales was in danger, which isn't very troubling. Here they really did make it feel like a global problem with multiple locations around the world. Of course I know they didn't actually film in a lot of those places but it works. I wonder what's next for Torchwood? They're left a few plot threads open but not many clues. Also if I remember correctly the producers have said this is not going to be something they do on a regular basis but irregular specials instead. I'm busy trying to get my computers and network all set up correctly again. It's been going mostly okay but there have been some set backs. Nothing ever goes entirely according to plan when you're working on a big upgrade like this. Major things are done but it will be a while before I'm completely back to normal. However that's half the fun of such upgrades so long as progress is being made. It's September and the new season of television is underway. I thought I'd do a quick summary of what I'm looking forward to this year. Will Detective Beckett be okay? I expect so as she's a main character but how will it happen? I'm looking forward to this one a lot, always room for more Stana Katic and Nathon Fillion. Weird science and alternate universes with John Noble, a favorite of mine. I hope this will not be the final season. I don't actually know a lot about this new series. However it has a big buzz around it as it's Sarah Michelle Gellar's first return to televsion since Buffy. I'll at least be giving this a try. I was surprised by how much I enjoyed the first series of this remake. Let's hope season two can continue to hold me. Another one which I enjoyed more than I expected to. Although storywise this year is probably going to be a bit different. Time travelling dinosaur thingy from Steven Spielberg. Have at least give this a look. Although it sounds like they've been having some production issues. House has been pretty consistently great since the beginning but there are going to be quite a few major changes this year which is worrying. That's all for September. Later on there's also The Walking Dead and Bones. Not of lot of new series I'm paying attention to this year. Most of the pilots I was interested in did not get picked up. I loved the first Dawn of War game and played a lot. Unfortunately Dawn of War II never really clicked for me even though I really wanted it to. The game became part of the trend which is removing base building from RTS games and because of that it just didn't feel the same. I was probably busy playing perhaps Fallout 3 or Neverwinter Nights 2 when it was first release and so I never gave it much of a chance. Recently I decided I should give it another look as I do like that universe and some of the Dawn of War III news seems interesting. I've been making my way through the single player story campaign. There's not really much point trying to get in to the multiplayer scene for a two year old game which isn't your favorite. It played well and looked good. The story was reasonably interesting and the mission objectives varied quite nicely. I quite liked the RPG elements introduced with your units gaining persistent experience from mission to mission. However I still miss the base building aspect, it's a corner stone of the genre to me. Overall it was a nice campaign which I'm glad I found time to finally play even if it wasn't the greatest. It's one of those "things you think you should have done" items off the list. I'll probably still have a quick look at the expansions too. This was a very silly film. I've got nothing particular against crude humour but this fell completely flat for me. Still I actually managed to enjoy it somewhat as a cheesy fantasy film. That was because the great actors involved including James Franco and Natalie Portman, also excellent work on the sets and effect make a quality world for it. I'll admit Natalie Portman was the only reason I even tried this after seeing the trailer, in the end she had to save it, which she just about managed. Many more great Rory moments this week on Doctor Who. At this point I should probably give some praise to Arthur Darvill as well for his work on the character as I've not really mentioned him before. Amy gets another long wait for the Doctor that's almost happening as often as Rory dies now. That's not a complaint, just an observation. I very much enjoyed the episode. We hear that Amy Pond is the only one with the will to change a fixed event in time. Does that sound like foreshadowing to anyone else? :D Did we get a shot of the Doctor's death date again? I don't remember seeing one this week, not that I've forgotten. That's probably what I'd do! Bad luck and bad decisions mean that I probably won't be getting any new computer parts until next Tuesday at the earliest now. At least I have backup systems, but it's not the same. Also it's disappointing when you expected to be putting the finishing touches on a new server at this point but now you have to wait another four days. Now exactly the end of the world but that's been the major highlight of my day. I'll go back to film catch up now and continue my sorting. My server issues are in hand, new parts have been ordered. Although they're not going to arrive as soon as I'd hoped. At point of sale the website said everything I wanted was in stock but by the point of dispatch they couldn't fulfil the order. This has happened to me before and unfortunately you never find this out until it's too late to change the order for next day delivery. Which on a Thursday night means you'll end up having to wait until Monday. I wanted to spend the weekend fixing this, so I'll have to modify the order and pay the extra £10 for a Saturday delivery now. Still this has highlighted a different issue that I can deal with in the meantime. I've been looking though all the spare parts that I've collected over the years and realized that some items are getting on for ten years old. There is no reason I can think of for which I was need these parts. It is time for a sort out. I've got more leftover IDE cables than anyone could ever need considering they're no longer in use. Hardware failures are always a hassle. It's certainly changes any plans I might have has blog-wise. I have to figure out the best way to get things working again now. I did realize that the computer with the problem is over five years old and had been pretty much running 24/7 the whole time. So that's actually not bad for a cheap development server. This one isn't actually even close to being a new release. I never managed to catch this one before and I recorded it a while ago. It has been sat on my Sky box waiting but kept getting skipped because it's a bit on the long side. Yesterday I decided I needed to reinstall the software on one of my local servers and I needed something to help pass the time along with that. 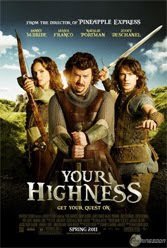 It is also the only Peter Jackson film I've never seen before so it's about time I fixed that. I've since found myself wondering if I've ever actually seen the original or whether I'm just remembering the iconic scenes from popular culture in general. This version was good though and it didn't seem to long for me. Although I was doing two things at once. I have to say though that some of the effects shots haven't aged well and it's only 6 years old. The problems are where real actors are composited with the creatures. It just seemed a little off especially when compared to Jackson's previous film. 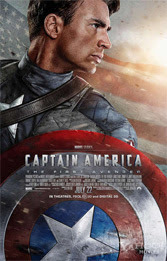 Second film in my catch-up week is Marvel's latest offering Captain America: The First Avenger. I enjoyed the film but as I stare at the screen I find myself unsure as to what I can write about it. I don't want to end up just writing a synopsis. I wonder if perhaps that the World War II setting just doesn't appeal to me as much. Chris Evans was good though, you quickly forget that he's actually been a Marvel superhero before (Human Torch in Fantastic 4) this is a whole new era of Marvel now. Hugo Weaving was also excellent as Red Skull and Tommy Lee Jones needs a mention for great supporting role. It's more origins out of the way so The Avengers doesn't need to waste time with too much exposition. Then once this gets a solo sequel we can find out what Captain America is really like. 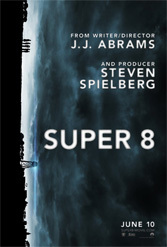 Day one of my film catch-up week and to begin with we've got Super 8. It was fantastic. I quickly realized that I knew extremely little about the story of the film. I'd seen the trailers of course but they were particularly vague, although they were good. I had not seen any clips nor had I read any interviews. It seems my interest in the film came simply from Abrams and Spielberg being involved and a bit of general hype. Generally I avoid spoilers, but there are many levels of that. I think the last film I saw with so little foreknowledge was the Matrix and that was twelve years ago now! If I had to describe this film quickly I think I would say it's a mix of ET, The Goonies and a dash of Cloverfield. I'm not going to say anything else about the story as I'm sure the not knowing was part of was made it so great for me. The little actors playing the kids are all great. Just like Sean Astin or Drew Barrymore in the films I compared it to, some of them will grow in to much bigger stars I'm sure. The film also looked great although Abrams still loves his lens flare. The sets were one of the best parts. I could be wrong as I was only three months old at the time this film is set but it feels very authentic to me, to the point it could have been shot as "present day" in 1979. Highly recommended. We're dead aren't we? Again! I've said more than once that Amy was my favourite companion. Not just of the modern series but of all time. However over the last couple of episodes I've come to the realization that Rory is actually my favourite now. He's slowly grown over time and become a great addition to the series. He's always able to see the funny side of things and is often the first to use common sense. The perfect British keep calm and carry on attitude. Through being busy and disorganized it seems I have missed some of the recent films I had hoped to see in the cinema. I'd already accepted that I had missed Captain America but I was looking at the listings this afternoon and found that wasn't the only one. I was thinking I might see something on either Saturday or Monday but now I've changed my mind. I was surprised to see that Cowboys & Aliens wasn't showing in Sheffield anymore as it's only been on for two weeks. We do only have eight screens in Sheffield centre so I guess they'll only keep the really big ones. 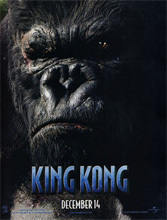 So while Super 8 and Conan aren't on anymore, Rise of the Planet of the Apes is. So I've decided I'm going to have a film catch-up week via "other" sources. Sorry film makers, I'll make it up next time and of course if I like them I'll be buying the DVD/BD. So we'll have a bunch of mini film reviews on the blog this week. You should pretend I saw these a while ago but I'm only just posting about them. So Star Wars is about to be released on Blu-Ray and I have been wondering if I should get it or not. For a long while I thought probably not. After all I do have three copies on VHS and two copies on DVD already. Then more recently I thought I probably would end up getting it, I am a collector after all. There some new features that might be interesting, although probably not enough if I'm honest. However finally the clip below appeared online (along with at least three others). It seems George Lucas still isn't done tweaking the films (even the prequels) and there are going to be changes again. I think I might skip this version and wait for the next one. Adding CGI blinks to Ewoks I can cope with. Greedo still shooting first, I've already learned to ignore that. Changing Obi-Wan's Krayt Dragon call in A New Hope, annoying but gone in three seconds. But this? I don't think Vader's motivation here was ever in doubt, this is just distracting.